Can you say YUM?? My mother gave Bill and me a gift certificate to Les Halles, Anthony Bourdain’s French hot spot in the city and BOY did we have a great time! 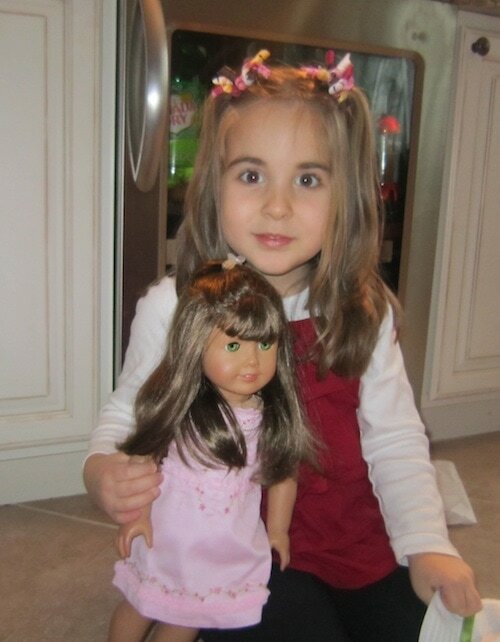 My mother and aunt bought Natalie some clothes from the ‘American Girl Doll’ store and they were too big. We decided to head into Manhattan and make the exchange. I shot some footage just in case you were curious to see what the inside of the ‘American Girl Doll’ store looked like. It was AH-MAZING. And if you are looking for great French food, PLEASE check out Les Halles. I was practically licking the plate. I loooooooooove how you say Les Halles 🙂 It sounds more like ‘lesalluh’ You pronounce the 2 words like it’s one word and don’t pronounce the s in halles! Your kids are too cute. Actually no, it’s h muet (not h aspiré then you would be correct) so you make the contraction. Love the video! Looks you all had such a great time. Beautiful family, beautiful memories. You and Bill are such great parents. You’re ALL very lucky to have each other. Life is all about memories; making them and remembering them. Aww i love the American Girl Store. It really is something else.